It’s been a long time since my last update, when Maggie was diagnosed with failing back legs and taken to the Monash Vet clinic to participate in an experimental new stem cell procedure for arthritis and other joint problems. For some reason, while the fur on her elbow grew back right away, the circles on her hips are still growing. 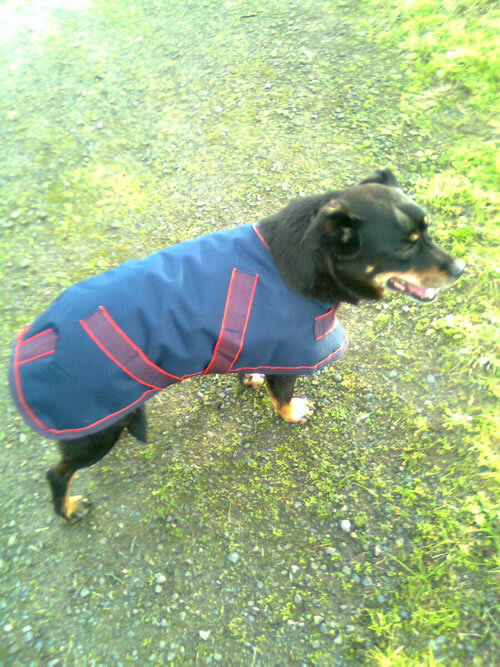 So in winter, I bought her a spiffing blue coat to wear in the park. 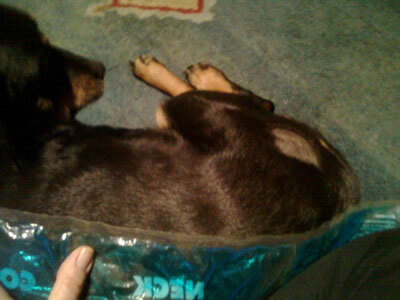 She’d never needed such a thing before, as a double coated dog living in Yarraville, but she thought it was pretty good. Then we waited. And she’s seen every six weeks or so. The vet checks her over and updates her progress for the stem cell study. Six weekly vet checks with a Cartrophen injection. But she held her own, and was happy. Then, sometime in December, something happened. She started to run a little. Just here and there. Her body language has changed – there’s a swagger in her step. The vet says it’s because we’ve got that back more comfortable. She’s still in two minds about that vet. No more alien abductions and shaved bits, but she gets a needle every time. Not her favourite thing, those vet visits. I like them though, because he’s always pleased with her, so far. Maggie was given maybe a 6 month prognosis last January if nothing was done. A year on, and she’s enjoying life to the full. She still walks a little bit skewwhiff, but she’s happy, healthy and having fun. Now let’s see how long we can keep that going. oh darling doggie how lovely to have such loving and dedicated human companions. After all that effort may you, and they, skip and romp with joy. It’s no effort for that beautiful girl. And selfishly, we get to have her for longer. 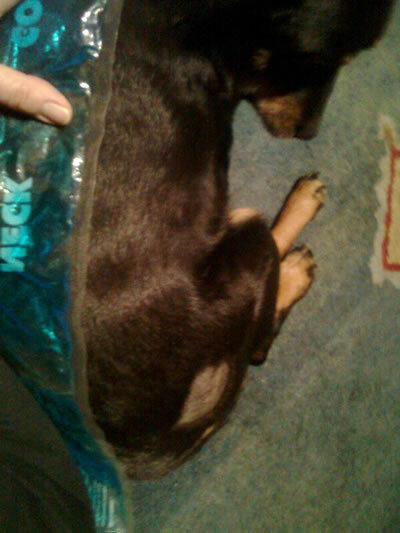 Hot packs are twice daily not daily as I’ve written there (fixed now), and it’s actually a lovely thing that you have to sit on the floor for two short periods communing with her and scratching her ears. It’s an enjoyable time especially in the morning before work when everything is quiet. We have a very oldy who also has arthritic knees/shoulders. She’s been on anti-inflammatories for the past 3 months – too old to worry about longterm side effects now. Also a natural powder on her food ever night. Mentally she’s as birhgt as a button but she gets very subdued when she occasionally hurts herself. Tht’s hard to see. I like the sound of Maggie’s little run. I missed this blog when you put it up, Helen and am so glad for Maggie! Love her blue coat, too.